I don’t think posting ads on content which we do not own is a valid reason or else many would be banned. AFAIK your posts only had a video clip with no content right? Publishers may not display Google ads on pages or apps with content protected by copyright law unless they have the necessary legal rights to display that content. This includes sites or apps that display copyrighted material, sites or apps hosting copyrighted files or sites or apps that provide links driving traffic to sites that contain copyrighted material. If you didn’t create the content yourself or if you created it using other peoples’ content as source material, you should ask yourself if you have a licence or if an exception applies. For more information about potentially infringing content, please review our programme policies and these tips from the policy team about avoiding copyright infringement. Additionally, you can watch our short animated video & policy refreshers. That’s their explanation. If you are getting copyright strikes it’s better to start working to fix or find other ad network. You don’t know when adsense might ban you. This is crazy. So 4 top website who are my competitor and post similar to my content got their Adsense disabled as well. I have a feeling this has to do with Article 13 google is taking serious action against Copyright content. 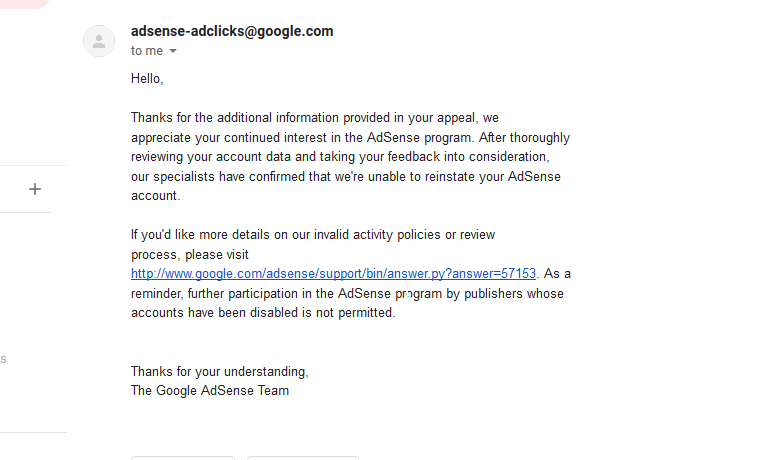 If in your case adsense was banned with invalid click or any other reasons, there are other form just google you will find it. If you use same mobile number in multiple adsense account or a number associated with previously banned account… your new account will also be suspended. If u Use multiple account then do with different family members number and all details of them. Adsense allow one adsense for one person only. In one pc use different user login for different account in chrome. Use different address in account. Yes, you’re right. I faced the same issue, 3 years ago. Actually before starting blogging i was using admob and facing same kind of issue. So i have little experience about these. Which is still made by new bloggers. They do it just like hotchpotch and destroy their adsense account and their name got blacklisted for adsense. Sorry, we have no control over it. but you can help me with the process.